Accommodating up to 70 guests, Sugar & Spice Spa/Event Center offers unique, full/partial wedding ceremony and reception packages as well as the option to add from our gallery of onsite services. We can provide you a beautiful venue in addition to a magical and memorable experience down to the very last detail. 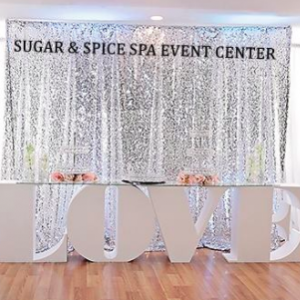 Whether you are planning a wedding, Social Soiree, or a corporate event, Sugar & Spice Spa/Event Center is one of Mason Best location for your celebration. Let us assist you when planning your special day, and we are confident that you will be delighted that you selected Sugar & Spice Spa/Event Center. Please call to schedule a complimentary tour and event consultation. Sugar Spice Spa's Mission is to have a positive effect on our community by empowering our girls & boys with a positive self-image.